If you are at Kpalimé or if you would like to join us there, the most essential help that you can give us is to support us in our projects. If you want to visit us, please have a look on the page “Contact us”. If you want to become a volunteer, please check out the page “Volunteer for L.I.R.E.”. However, if you have not enough time or if you live too far away to join us, you can still support us in terms of material which will be a precious contribution for the implementation of our activities. The activities created by the Association L.I.R.E. and offered to the students are free of charge for them, or amount to a symbolic fee. The organization’s activities are not and are not meant to be lucrative. Still, despite the volunteer service of all its members, the association has to confront some operating costs: maintaining the material, purchasing books, offering prices for competitions and exceptional events, etc. 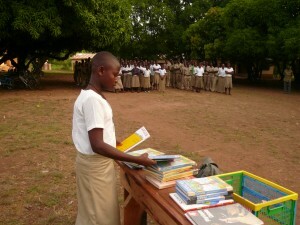 Books distributed as prizes after a reading contest. We can offer you several ways of join forces in our activities/actions. Although all kind of donations are welcome, we remind you that supporting us regularly is the best way to allow to work positively and to achieve a good visibility for the development of future projects. – offering us material, essentially books.